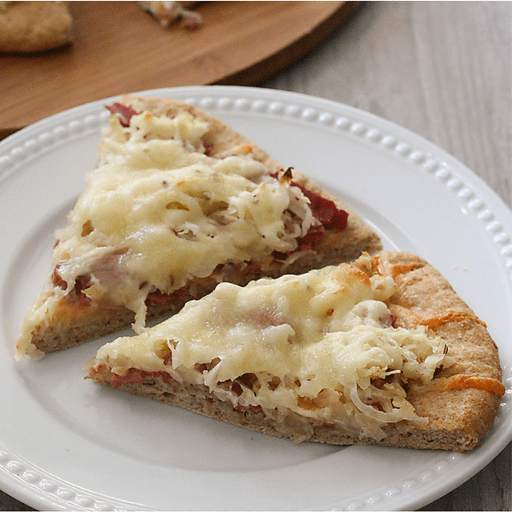 We've given the classic Reuben sandwich a trendy makeover and transformed it into Reuben Pizza. You read that right - all the delicious corned beef and sauerkraut flavors are piled high on this delicious pie. This pizza is the perfect way to use up that leftover St. Patrick's Day corned beef. 1. Preheat oven to 425°F. Spray a pizza pan with cooking spray and set aside. 1. On a lightly floured surface, roll out pizza dough into a circle that fits the pizza pan. Place dough on prepared pan and brush edges with olive oil. Bake for 5-10 minutes. 1. Once dough is prebaked, remove from the oven and spread Thousand Island dressing onto the pizza. Top with corned beef, sauerkraut and cheese. 1. Return pizza to oven and bake until cheese is melted and crust is golden brown, about 10 minutes. Remove from oven, slice and serve. Calories 390, Total Fat 20g (Saturated 6g, Trans 0g), Cholesterol 35mg, Sodium 1040mg, Total Carbohydrate 38g (Dietary Fiber 4g, Sugars 4g), Protein 16g, Vitamin D 0%, Calcium 15%, Iron 15%, Potassium 4% *Nutritional values are an approximation. Actual nutritional values may vary due to preparation techniques, variations related to suppliers, regional and seasonal differences, or rounding.